Why can’t I swipe or use my token on GO-POINTS? What services will I get a token from? How do I earn points on GO-POINTS? How do I use my voucher that I purchased? 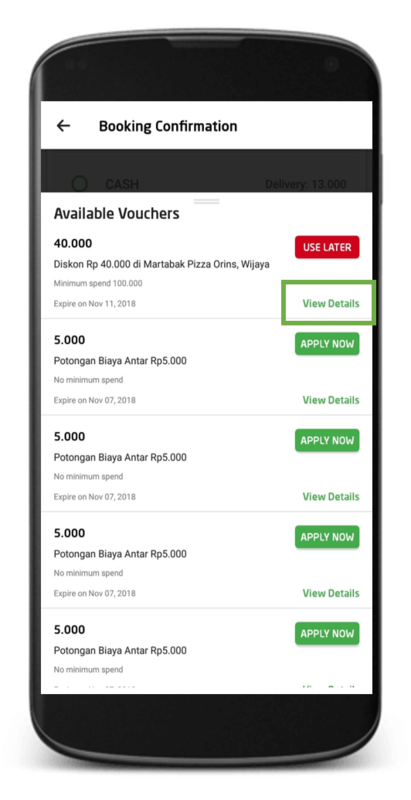 You can find all of your vouchers that you have such as vouchers that you buy with GO-PAY, GO-POINTS points, or other vouchers in 3 (three) steps: on the top right corner of GOJEK homepage, GO-DEALS or in the My Account page. You can see the voucher in ‘My Voucher' in the ‘My Account’ page. Always check terms, conditions, and voucher’s validity period. When the voucher is expired, it will disappear from this page. 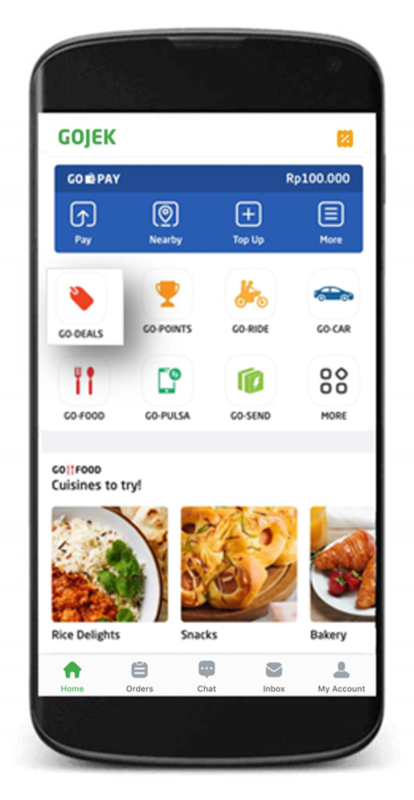 GO-POINTS is a loyalty program for customers who use GO-PAY as the payment method for GO-RIDE, GO-CAR, GO-FOOD, GO-SEND, GO-SHOP, GO-PULSA, GO-BILLS, GO-TIX, GO-BOX, GO-MASSAGE, and for payment at stores that listed as GO-PAY merchant. 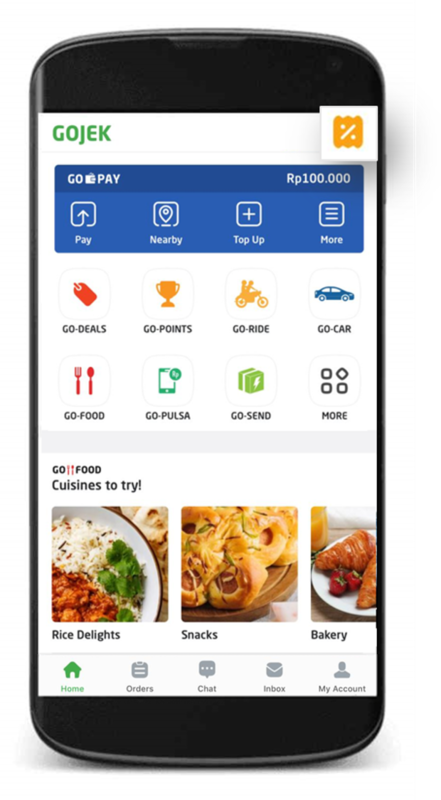 Also for customers who use cash as the payment method for GO-RIDE, GO-CAR, GO-BLUEBIRD, GO-FOOD, GO-SEND, GO-SHOP, and GO-BOX services will get a token as well. 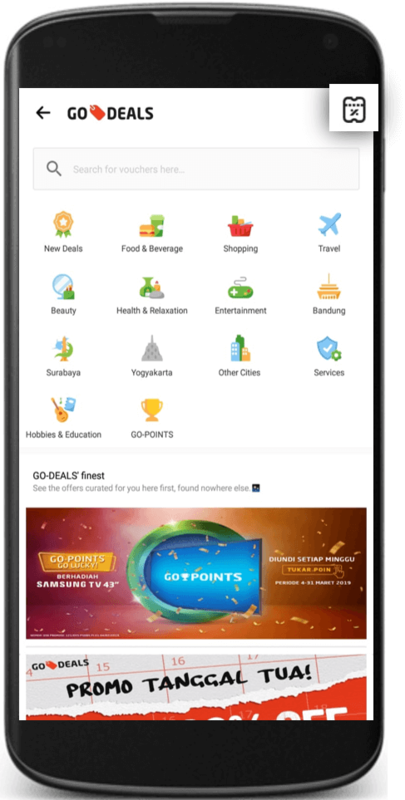 Customers will get token to play game and earn points on GO-POINTS which be exchanged for various vouchers. 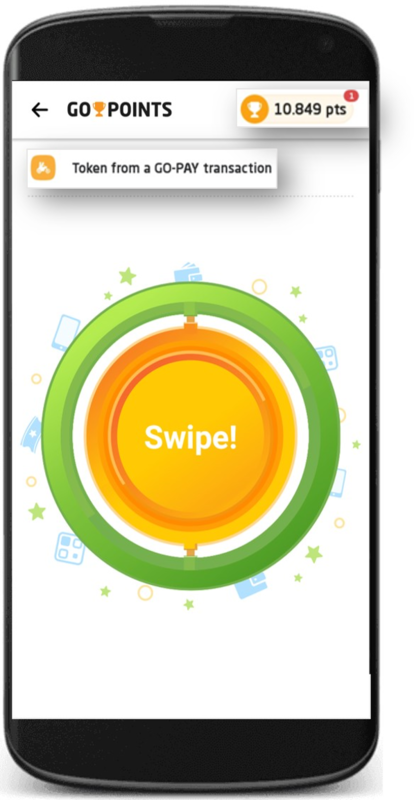 Before swiping the token, make sure that you have tokens to be played. If you can't swipe the token, please log out your GOJEK app and try again later. Yay all done! Now you can restart the device and try again. iOS device users are advised to update the GOJEK application to the latest version. After that, restart the device and try again. You can also get a token every time you use GO-PAY as payment method when purchasing at stores that listed as GO-PAY merchant (online and offline). Maximum token that you can get from paying at stores that listed as GO-PAY merchant is 5 (five) tokens for each store type (online and offline) per day. 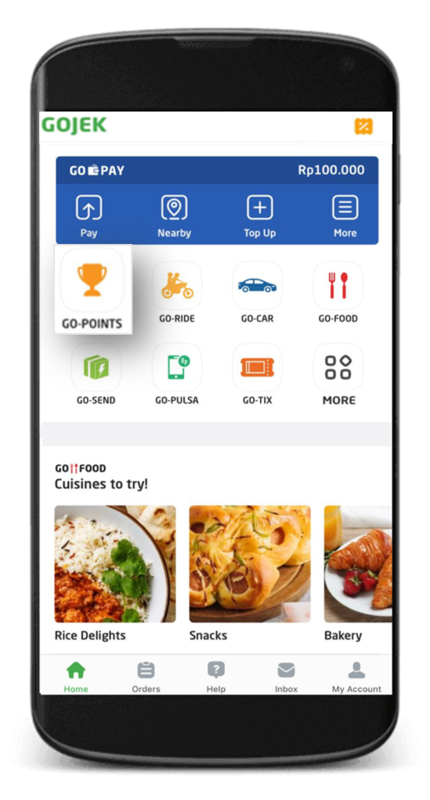 In the latest version of GOJEK app, you still can see your GO-POINTS points by clicking the GO-POINTS menu on your GOJEK home page. Can I play the tokens at once? Of course, you can! Yayness! Let our system play the tokens for you, and all you have to do is just sit back and relax. That’s awesome! How to do it? Please kindly read the terms and conditions of the voucher before you use or redeem it. It’s because each voucher has different terms, conditions, and how-to-use. Please note, that those steps above are general information on how to use the voucher. So, please re-check the terms, conditions, and how-to-use of each voucher before using it. Anyway, here are the steps if your voucher is already applied, but you want to change the voucher. Click 'Back' button on your phone to go back to your order page. PLEASE REVIEW THIS TERMS & CONDITIONS CAREFULLY PRIOR TO USING THE GO-POINTS FEATURE IN THE APPLICATION. “User” means any user of the Application that uses GO-PAY as payment method. A. Subject to the limitations set out in this Terms and Conditions, each transaction in the Application using GO-PAY will entitle the User to receive one token, or multiple tokens during promotion periods which will be determined in our own sole discretion. User that transacts on the GO-PULSA feature of the Application will only be entitled to one token per day irrespective of the number of transactions completed through the GO-PULSA feature. For the purpose of this clause, a day is calculated from 00:01 up to 24:00 in the same day. B. 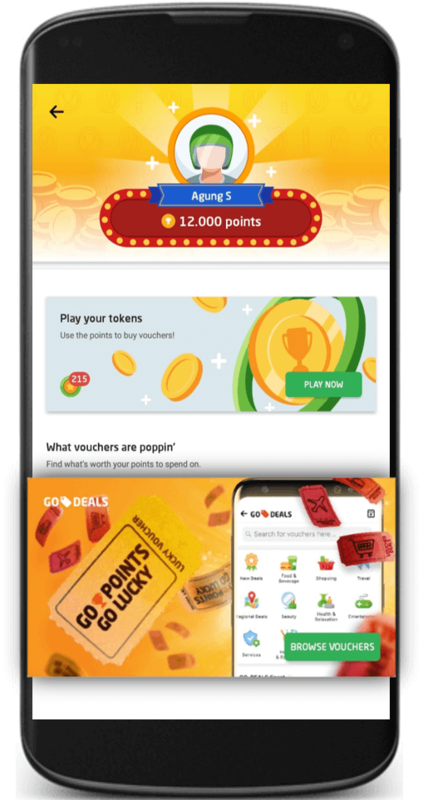 User can use the token that have been issued to them to play a game made available in the GO-POINTS feature of the Application to collect Points. 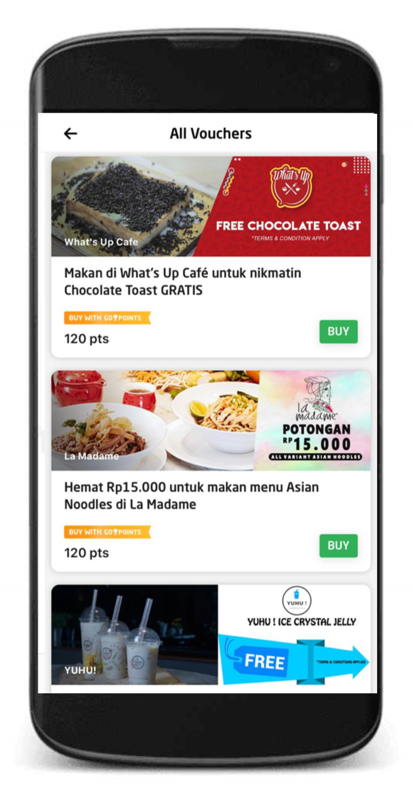 C. Points that have been accumulated by a User can be exchanged with rewards displayed in the GO-POINTS catalogue which are accessible through GO-POINTS feature of the Application. The exchange of Points is subject to the terms set out in section 2.2 below. D. Points are non-transferable and only valid to be used by the User to whose account the points were issued to. 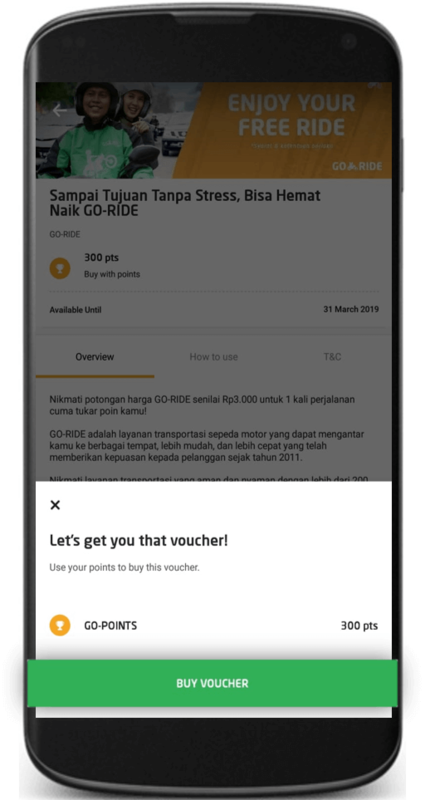 User can buy or redeem vouchers for rewards displayed in GO-POINTS catalogue in exchange of the points a User have earned. The specific terms and conditions for the redemption of a voucher may differ between different rewards, including but not limited to the amount of points required to redeem the voucher. The specific terms and conditions will be specified in the GO-POINTS catalogue. 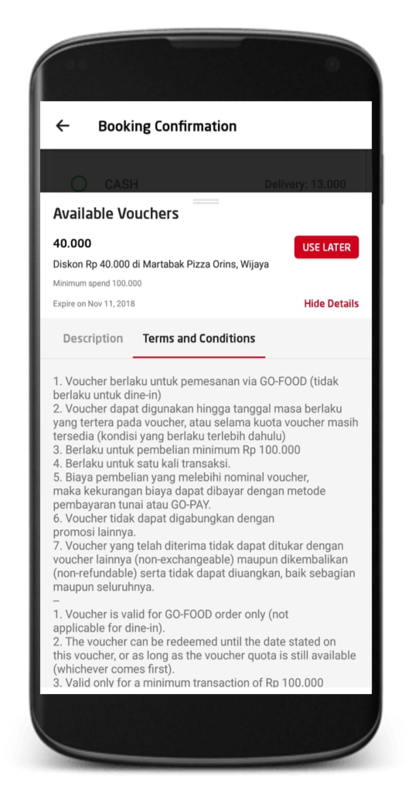 Before redeeming a voucher, User should read the specific terms and conditions applicable for the relevant voucher. 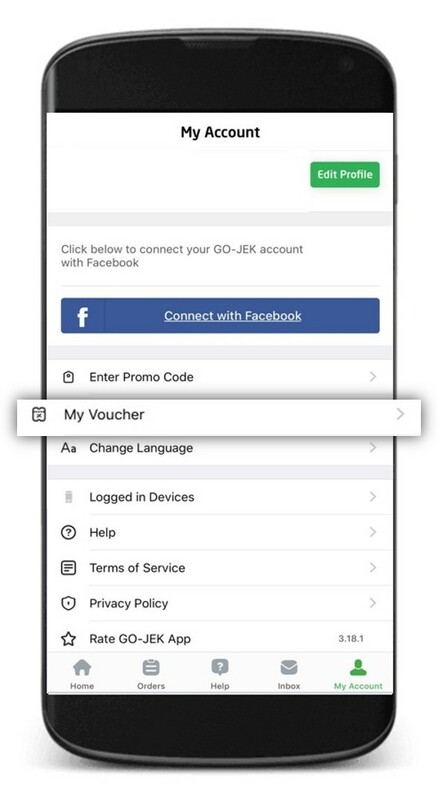 Vouchers that have been redeemed by User will be stored in “My Voucher” page in the Application. 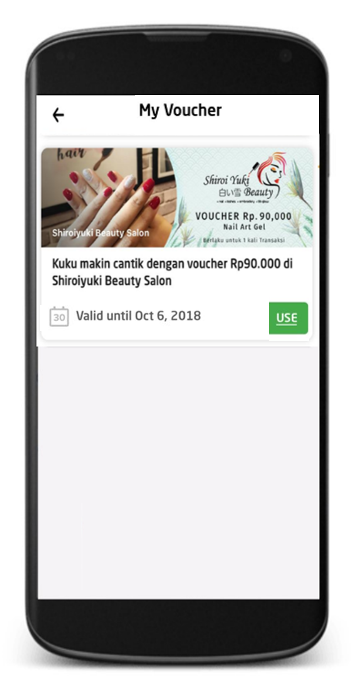 To use the vouchers to redeem the rewards, User can click the “Get Voucher Code” button and such User will receive a voucher code which will be valid for 24 hours after the User clicks the “Get Voucher Code” button. Voucher codes that are not used within the specified 24 hours period will automatically expire and will no longer be able to be used. 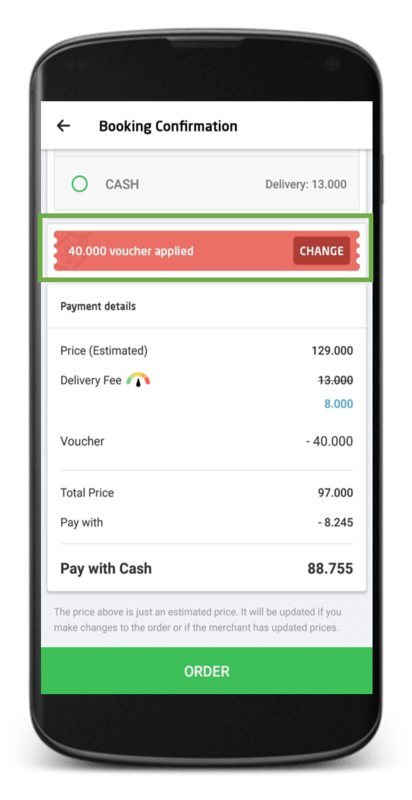 Once redeemed, a voucher code may be used by the User in accordance with the specific terms and conditions applicable for the relevant voucher code. Any unused or expired voucher codes and rewards cannot be refunded. User is prohibited to sell, transfer or otherwise or monetize any tokens or points. 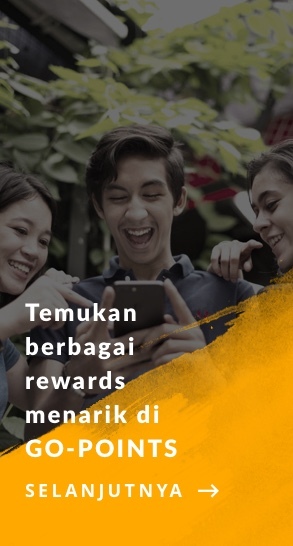 User is eligible to enjoy the rewards provided by GO-POINTS if such User obtains the tokens, points, vouchers or voucher code in accordance with any applicable terms and conditions in the Policy. User agrees that we can, based on our sole discretion, invalidate the token(s), point(s), voucher(s) or voucher code(s) that were obtained by a User in violation of the Policy. The redemption of certain vouchers may be subject to specific users’ eligibility which will be stated in the specific terms and conditions applicable for the relevant voucher code. Before redeeming a voucher, User should read the specific terms and conditions applicable for the relevant voucher. The User agrees, upon our request from time to time, to provide and/or confirm any information required by us in relation to the User’s data or account. The User hereby agrees that we may amend this Terms and Conditions from time to time, where all amendments to the Terms and Conditions, which may cover additional provisions and change to any existing provision, will be effective by notification to the User or other media that are easily accessed by the User such as electronic media (including but not limited to the Application). The User agrees that the User’s continuing access or use of GO-POINTS after the date of notification on the amendment to the Terms and Conditions shall be interpreted in the way that the User has agreed to be bound by the Terms and Conditions, as may be amended or supplemented. For the matters that are not specifically regulated in this Terms and Conditions, the User declares to be subject to every provision and operational procedure that are applied by us as set out in the Policy, either at the time being or as may be amended from time to time. Any complaint relating to the use of the redeemed vouchers and/or goods may be delivered to the relevant merchant and/or store of such vouchers and/or goods as stipulated in each specific terms and conditions applicable for such vouchers and/or goods. Other User questions and complaints in relation to the GO-POINTS service may be delivered in writing by sending an email to customerservice@go-jek.com or call (021) 5025-1110. We will verify the User's data with the basis of the data provided to us by the User at the time of the User’s registration to the Application. We are entitled to refuse to process a question and complaint submitted by a User if the data verified by the User does not conform to the data stored in our system. We will check or verify a User's complaint as well as respond to the User in accordance with the policies and procedures applicable at our company after receiving a completed submission of a complaint from the User. By agreeing to this Terms and Condition, the User represents that we provided an adequate explanation regarding GO-POINTS which will be utilized by the User and the User acknowledges and understands that any consequence of using the service of GO-POINTS, including the benefits, risk, and any cost related to the service of GO-POINTS. The User hereby represents that the User has read and understood this Terms and Conditions as a whole and has approved the content of this Terms and Conditions. The User hereby gives an electronic agreement consciously and voluntarily without any oppression by any party on this Terms and Conditions and has acknowledged that this Terms and Conditions shall be binding to the User and the User has the obligation to both perform and comply with every conditions in this Terms and Conditions upon the use of GO-POINTS.